Tableting at its best. IMA Active’s tablet press machine installed into the Finnish pharmaceutical factory. More than 170 employees, 3 production plants, over 22 million Euros of turnover. These are the numbers for Vitabalans Oy, the Finnish GMP-pharmaceutical factory where the quality of the products is guaranteed by product development, quality control and quality assurance. Vitabalans Oy develops, manufactures and markets prescription medicines, OTC medicines, food supplements and veterinary products. All the facilities and production, research and product development are located in Hämeenlinna, 100 km north of Helsinki. Founded in 1980, Vitabalans Oy started foreign export in 1995. In twenty years, the Company has expanded on the European market and has subsidiaries in Estonia, Latvia, Lithuania, Poland, Czech Republic, Slovakia, Hungary, Slovenia, Sweden, Denmark, Norway and Germany. The Company’s production facilities cover not only tablet manufacturing but also manufacture powders, creams and solutions. «State of the art facilities and modern machinery, combined with well trained and highly motivated staff are the foundations which our Company is built on», says Juuso Karvanen, Production Manager at Vitabalans Oy. In this context, the installation of Prexima 300, IMA Active’s tablet press machine, took place last year. What were your requirements for the new tablet press machine? Which were the criticalities of the product manufacturing? We were looking for top-level performances. The main criticality related to our product manufacturing derives from the hardness of the tablets, which would require high compression forces. Our old tablet press machine could not keep so high compression forces without decreasing the speed. What was your main reason for choosing Prexima? Prexima ensures optimal performances even with the most difficult-to-handle powder substances. We performed a series of tests at the IMA Active Laboratory and the machine performances proved to be top-level. Prexima tablet press reaches the high compression forces required for our product manufacturing without reducing the speed. The machine robust structure guarantees both pre-compression and main compression forces up to 100 kN with maximum reliability. The overall tablet quality is always assured: Prexima keeps the tablets uniform in terms of weight and hardness. In addition, Prexima simplifies maintenance. Limited surfaces in contact with the product reduce cleaning times and avoid contamination. Our collaboration with both the sales and the technical team was good. We faced only a single problem on the machine: a qualified IMA technician provided prompt and excellent support. In the end, everything was solved with great satisfaction. We have been successful in expanding our Company by increasing business with existing customers and by acquiring new customers. To support this trend, we will extend our range of machinery in the coming years. After the new Prexima, the next step will be the installation of Effecta, the coating pan designed and manufactured by IMA Active. The testing at the IMA Active facility was performed on two food supplement formulations for direct compression. It was necessary to achieve good output by manufacturing oblong shaped tablets of high weight (approximately 1.5 g). The compression was carried out on Prexima 300 tablet press, equipped with the two paddle feeder, which was able to assure the requested weight uniformity at high production speeds. The observed standard deviation on the compression force was kept within 3-4% during testing. The compliance with Vitabalans Oy acceptability limits for the weight could be successfully met through the autoregulation loop, based on the target compression force. 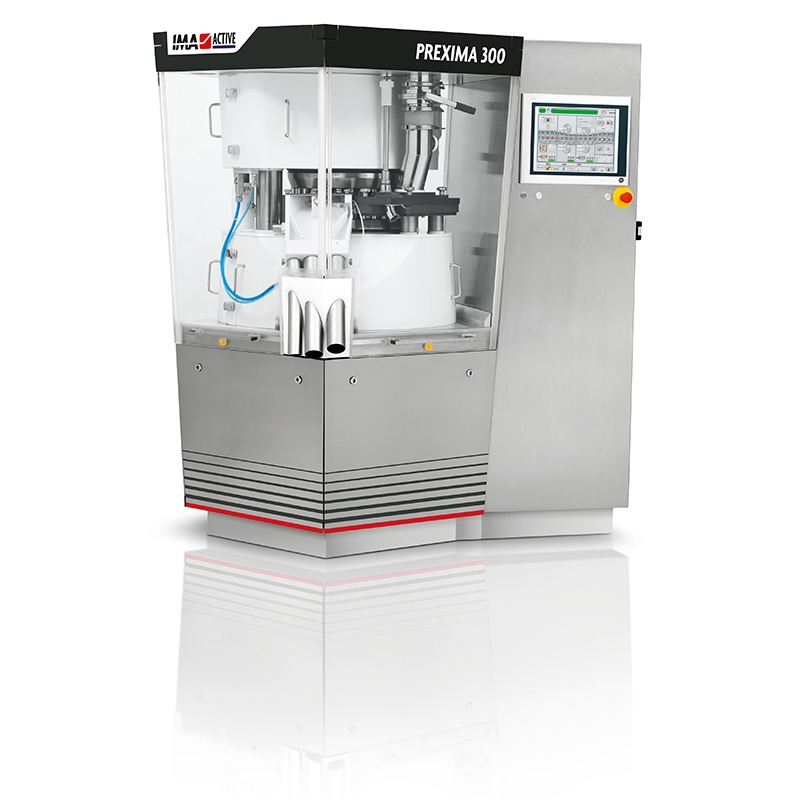 The high flexibility of the Prexima software in terms of autoregulation limits and correction factors allows for finely tuning the dosing step and helps to maintain the weight at the same value during the production. Due to the product flowability, the best results in terms of feeding uniformity were observed at medium-high paddle speeds. In order to meet Vitabalans Oy request regarding the product hardness it was necessary to assure constant relatively high compression force: Prexima is equipped with two compression rollers of the same diameter, enabling it to apply the same pre-compression and main compression forces as required by the process. Furthermore, for this application the machine was equipped with Eu-D tooling type 441 to further extend the compaction time.